Not only do I associate Mom’s Classic Carrot Cake with Easter, I always associate it with my baby Sis. See, carrot cake, which is pretty much a breeze these days in the food processor used to be kind of a big deal to make. There were a lot of carrots that had to hand grated, so it was always labor intensive. And therefore, not made very often. Or as I said, for special occasions only. So one year, as the cake was layered, the center filled, just waiting for Mom’s Cream Cheese Frosting to go on top, Mom must have walked away – and she came back to a cake with a big hole in the top. We kids were probably lined up for some heavy interrogation, but it was my baby sister who offered the most probable explanation of what fiasco befell the cake. “A little mousie must have eaten it.” The hole was filled with frosting and no one noticed the difference, no harm, no foul. I don’t think any little mousie could have resisted a taste of that cake! I don’t you’ll be able to resist, either. It’s worth mentioning, I think that I also have my Stepmom’s carrot cake on my site, the Wayside Inn Carrot Cake. Sorry, Mom, but that cake is delish, too. It’s a much finer, cake, meaning it has more of a tighter, fine crumb than this cake, and it’s a little lighter and airier. It’s more cake-like than carrot-cake like if that makes sense? Mom’s cake is what I think of as a more traditional classic carrot cake. It’s heavy and moist and just a bit courser and has more carrots in it than the Wayside. I wouldn’t turn down a slice of either, though, if you get my drift! 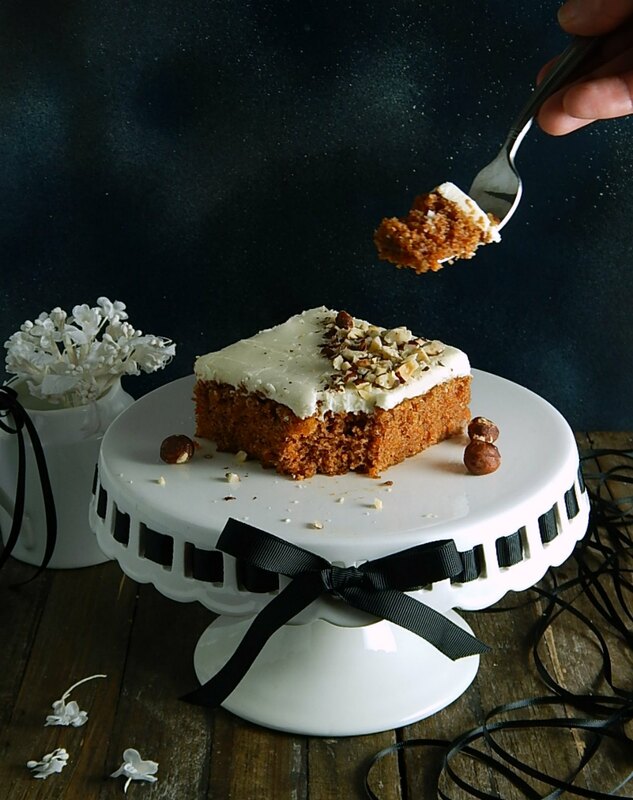 Mom’s Classic Carrot Cake is the perfect foil for Mom’s Creamy, Dreamy Cream Cheese Frosting, which I just happen to have on my site (what are the odds? Lol!) which is a nice, thick cream cheese frosting capable of handling this cake, even when layered. For a layer cake, I’d double the frosting, though. I wouldn’t want to be at all chintzy and a single batch – well that was fine for the 1960s; we expect more of everything these days! I used the frosting as written for this sheet pan version but honestly maybe next time I’d put more frosting on this, too. Mom’s Classic Carrot Cake (other than the peeling and grating of the carrots) is a super easy, cake. Really a child could make it! When prepping the carrots, keep in mind that the cake is a little prettier if the carrots are peeled, but they don’t have to be. Speaking of pretty, don’t grate the carrots too far ahead or they can discolor a bit; they can be peeled ahead, but put them in water if you do and make sure they’re not dripping wet when they’re grated. There is one caveat to know about this cake! I have found over the years when using my food processor, which only has one size grater, that the grate is just a bit course, and that can make the finished cake seem a bit oily. If you’ve ever encountered a carrot cake that seems oily, that’s probably the issue. I have an extra little touch that makes this cake perfect every time. I don’t push the carrots through the food processor hardly at all. I just drop them in the hopper and let them go unless I need to give them the slightest bit of help. The grate is much finer than when they are pushed. Then I dump them into a bowl, switch to the blade and dump them back in the food processor and pulse them a few times so that they’re still distinct, not mushy or liquidy, but chopped just the teensiest bit more. Then I measure. It’s an extra step and up to you but give it a shot if you’re feeling it. I have only ever made Mom’s Classic Carrot Cake as a layer cake or as a sheet cake, so I’ll give you directions for baking both. Just FYI, I never put the nuts in the carrot cake and while Mom always used walnuts, I just decorated with some chopped hazelnuts because I happened to have a few I had no use for. Pecans would be good, too. There are photos of two different cakes; I really like how the slices look done with half the frosting sprinkled with nuts but it is a lot fussier and has to be done by the slice. Use a small piece of cardboard to keep one half relatively nut free. Around Easter really is a great time to make carrot cake. All the ingredients will likely be on sale, including the carrots, which seldom go at a discount. If you buy larger bags of carrots, unless they are on sale, you’ll likely find you’ll pay less per pound, so that’s the better deal. Carrots store well right in the bag they come in, which should be perforated. If not, poke holes in the bag. Don’t let them fall into any ridges in your fridge drawer; make sure they are at right angles. Turn your carrots over from time to time so they aren’t sitting in condensation and they’ll last longer. The best time to buy any baking goods is during the Winter Holiday Sales and during the Pre-Easter Sales so stock up. Aldi has prices that rival grocery sales prices. And even though I don’t use the nuts in this, stock up and freeze any nuts during those Winter Holiday Sales. They’ll likely be discounted some around Easter but the cuts aren’t usually as deep. Preheat oven to 375 degrees. Grease or spray a 10x15x1″ sheet pan or 2 8″ round cake pans. In a large bowl, beat eggs, oil, and sugar until smooth. In another bowl, combine flour, baking soda, baking powder, cinnamon, and salt; add to egg mixture and beat well. Stir in carrots and nuts. Pour into prepared pans. Bake about 35 minutes until the, when gently pressed springs back. If making in a sheet pan, carefully turn front to back at about 25 minutes. Check it early; ovens vary and this is a higher temperature. Cool on a wire rack. Note on servings: this cake goes further made in a sheet pan; I generally cut three slices across and five down the length, which yields 15 generous pieces. I’ll be sharing Mom’s Classic Carrot Cake at Fiesta Friday #269. It’s co-hosted this week by Moi and and Ai @ Ai Made It For You. This entry was posted in Click here for Fabulous Food Posts and tagged Cake, Carrot Cake, Desserts, Family Recipe, Freezes Well. Bookmark the permalink. Thanks, we just made it again yesterday! 🙂 It has to be the BEST way to eat carrots! I can’t wait to try this out,carrot cake’s my absolute favourite! Sounds good and I personally like the amount of frosting to cake…sometimes there is so much you can hardly taste the cake. I do love a good carrot cake! But like you said, it’s pretty dense and heavy, especially when it’s a layered cake. And thanks for co-hosting with me! Sorry it took me a while to come over here and check out your gorgeous carrot cake. Hi Wendi, and thanks! It should be an air fragrance! 🙂 Nothing says home more than something baked with cinnamon wafting through the house! lol! I would have to agree! Carrot cake is likely my favorite cake or muffin, but I usually scrape off the frosting on the commercial made cakes and muffins as I find too sweet. Your Mom’s cream cheese frosting sounds like it can be adjusted to my taste. That top of your Mom’s carrot cake sounds wonderful. Great tip on the carrot prep. I love that cake stand. I was a little jealous of that mousie, Petra! I have always been meaning to make one with pineapple but never have. I think because this is my go-to. Zucchini cakes are a surprise! And the Wayside Carrot Cake is surprisingly good, too- just don’t tell my mom. I do hope she can’t see everything I do, lol, cause she’d have a fit at seeing Pat’s cake mentioned, lol! lol!! I think there was always some competition on Pat’s part…she was on Mom’s home turf after all…One year I had to eat two Thanksgiving dinners. It was horrible…one Thanksgiving dinner is enuf to do anyone in! Thanks! It was delish! I told my son he might have a future as a hand model on my blog!! He was like, so can I eat that bite, now? Yum. I love carrot cake.